When we first catch up with Peter Quill (Chris Pratt), Gamora (Zoe Saldana), Drax (Dave Bautista), Rocket (Bradley Cooper) and Baby Groot (Vin Diesel) in Guardians of the Galaxy Vol. 2, they are getting ready to slay a giant tentacled space monster. And just like that, Marvel’s ragtag team of cosmic heroes is back in action, playfully trash talking with each other as they find ways to work together, and once again grooving to the same beat. This is Guardians of the Galaxy Vol. 2, a sequel that is tons of fun and also surprisingly moving, as it satisfyingly builds upon these now beloved characters in ways that are sure to please fans. It’s not quite as good as the original, but I still liked it quite a bit. When the Sovereigns, a race of golden aliens, call upon the Guardians to thank them for their service in slaying the beast, Rocket steals some batteries from them just for the hell of it, and they end up on the run as fugitives. A mysterious being known as Ego (Kurt Russell) helps rescue them from a spaceship attack, and as it turns out, Ego is Peter Quill’s actual father who is suddenly looking to reconnect with him. When Yondu (Michael Rooker), who raised Peter after he was abandoned as a child, finds out that Ego has returned, he fears there are ulterior motives behind his reappearance and is determined to get to rescue him, leading to mutiny from his team of Ravagers. The first film felt a bit tighter and obviously benefitted from the freshness of meeting the team for the first time, and Guardians of the Galaxy Vol. 2 can feel a bit bloated in terms of the amount of story strands it fits in. But this sequel works by giving us more of the same humour, heart and pitch perfect music cues, while also delving even deeper into the backstories of its characters. Director James Gunn appears to be once again having a blast behind the camera, bringing his unfettered imagination to the screen, and the film features plenty of thrilling set pieces and whiz bang special effects, including some more psychedelic moments of visual wonder. But the film is equally enjoyable in its little character moments, and the filmmaker clearly harbours great affection for these unique heroes. Much of the story revolves around the reappearance of Ego, and the relationship that he has with Peter Quill, and how this tests his allegiances to the team. The tension between Gamora and her sister Nebula (Karen Gillan) is also further explored, and the new characters, like Ego’s travelling companion Mantis (Pam Klementieff), who can read feelings and forms a connection with Drax, are nicely woven into the central group. Yondu, who spends much of the film teamed up with Rocket and Baby Groot, also gets a complete story arc that is beautifully handled here. 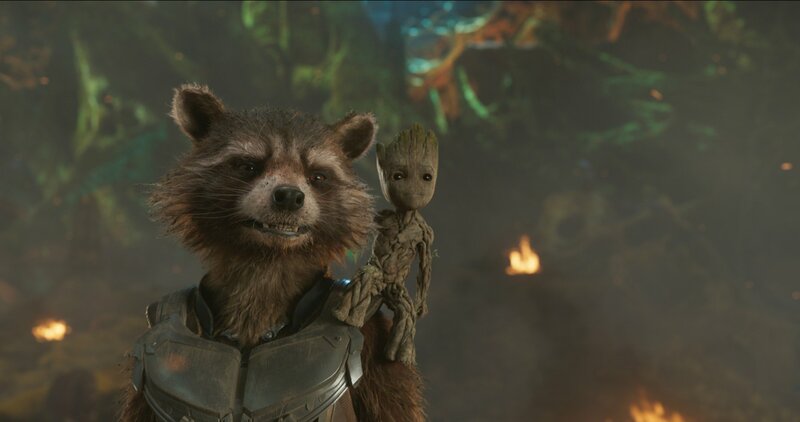 Baby Groot is an adorable scene stealer, and if you loved “I’m not a raccoon” Rocket the first time around, you are going to love him even more after watching him struggle to finally work through his emotional issues over being mistreated. The core cast continues to have great chemistry together both in the comedic and dramatic scenes, led by another movie star turn by Chris Pratt. I was once again incredibly impressed by Bradley Cooper’s voice work, and Michael Rooker in particular delivers a standout supporting performance that ranks as maybe his best work. The film also works in a bit part for Sylvester Stallone, who we will hopefully see more of in future instalments, and a memorable onscreen role for Sean Gunn. The soundtrack offers another nicely curated “Awesome Mix” of old school pop songs, and the film gets extra points in my book for its perfect usages of Sam Cooke’s “Bring It On Home to Me” and Cat Stevens’s “Father and Son,” which plays beautifully over the film’s most moving sequence. Replicating the first film’s successful combination of great characters, a sly sense of humour and a lot of heart, Guardians of the Galaxy Vol. 2 is a sequel that delivers exactly what we want, building towards a genuinely emotional final scene. And in the film’s best moments, like a brilliantly choreographed sequence that sees an entire ship of people being slaughtered with the same arrow to the tune of “Come a Little Bit Closer” by Jay & the Americans, it becomes a piece of perfectly crafted pop entertainment that hums along as enjoyably as the songs on its killer soundtrack. If you liked the first film, then odds are you will enjoy this one as well, and stick around for a grand total of five scenes during the credits, which amusingly tie up a few loose story strands. The Guardians of the Galaxy are back. The Guardians have a unique feel outside of the other Marvel heroes – they are almost antiheroes in a way… rebels, outlaws, and criminals, who have banded together to protect the Galaxy that they live in. 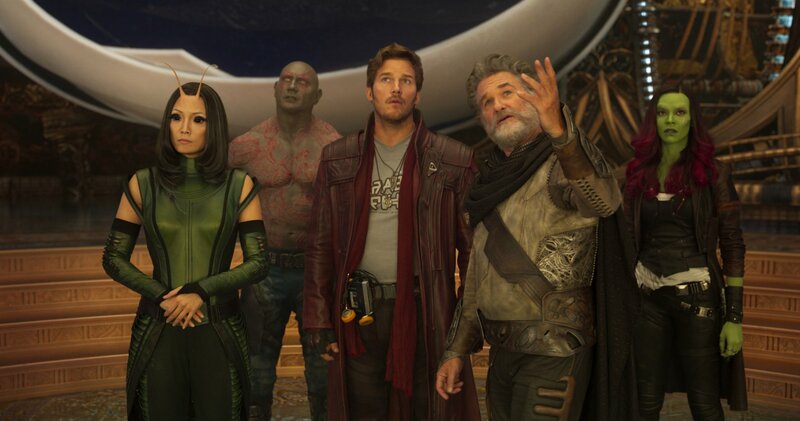 While in the first film Peter Quill aka Star-Lord (Chris Pratt) is drawn into saving the Galaxy after trying to steal an Infinity Stone, this time the threat of galactic destruction comes from a more personal place when Star-Lord meets his father who is a galactic force to be reckoned with in the form of the planet Ego (Kurt Russell). While Star-Lord and his backstory is a central spine to the story, the other characters get a good portion of development as well, and in particular Rocket (Bradley Cooper) again provides voice to some of the feelings that have made them all antiheroes, hardened against rejection and trying to find their place in the family group they’ve become, despite being loners for most of their lives. The special effects are well done, with the film keeping with the style from the first instalment. The cast members are all well suited to their roles, and this is one of the things that really makes this series work so well. And of course, once again we have an awesome mix of music on the soundtrack as Quill’s cassette tapes provide diegetic sound within the fight scenes, a touch that further cements the internal sense of the Guardians, a group that seeks out a good fight or challenge – and will listen to music while doing it. While overall, the first film in my memory is slightly stronger, Guardians of The Galaxy, Vol. 2 is a fun summer blockbuster that stays true to its characters, expands on the first film, and puts the heroes in a much more personal fight for a change rather than a straight-up call to save the world. Of course, the world is going to be put in danger and need to be saved due to their personal story and actions, but the setup provides a good character-driven fantasy-action film. Guardians of the Galaxy Vol. 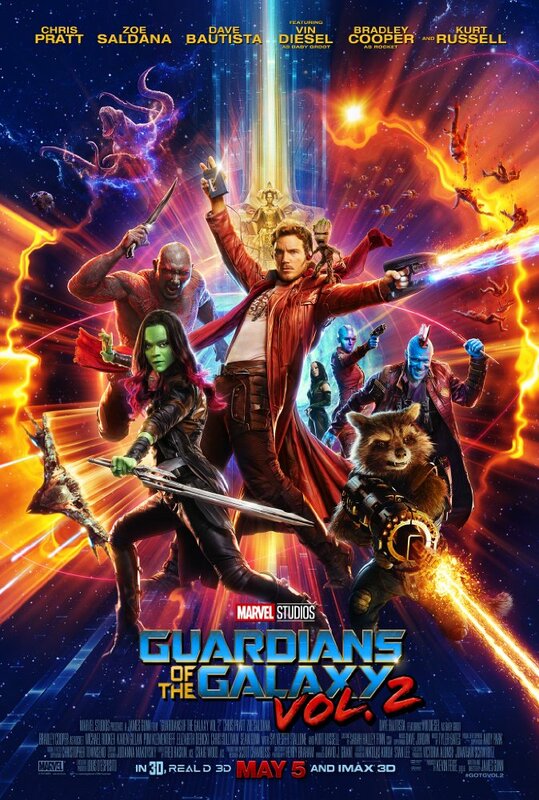 2 begins with Peter (Star-Lord) Quill (Chris Pratt), Gamora (Zoe Saldana), Rocket (motion captured by Sean Gunn, voiced by Bradley Cooper), and Drax (Dave Bautista) fighting a monster as Baby Groot (Vin Diesel) dances to the first tune from Awesome Mix Vol. 2. As payment, their pompous golden employer Ayesha (Elizabeth Debicki) hands over Gamora’s hated sister Nebula (Karen Gillan) as a prisoner. They then have to fend off a remote control drone attack before finding themselves rescued and brought to the beautiful world created by Peter’s long-lost father Ego (Kurt Russell) who lives there with his companion Mantis (Pom Klementieff). Meanwhile, the blue-faced ravager (space pirate) Yondu (Michael Rooker) is denounced by the ravager leader (Sylvester Stallone) for having abducted the boy Peter from 1980s, Missouri and keeping him rather than delivering him to his father. Yondu also faces mutiny from his own crew. Between Ego, the Guardians and Yondu, lots of interesting action is assured. Again co-written and directed by (Sean’s brother) James Gunn, Guardians of the Galaxy Vol. 2 continues the Guardians saga with more fun Marvel comic-book action, sharply-written humour between the characters, and another fine selection of Awesome Mix tunes.